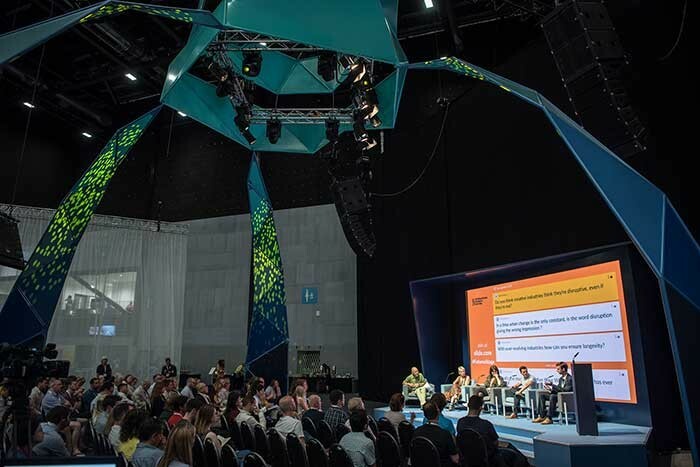 It’s the third biennial IBF event in which the company has been integrally involved, and the brief from client Liverpool Vision included installing full technical infrastructure for various environments and event meeting spaces that were utilised throughout the Festival. The scope of the work was twofold. Firstly, it was imperative to accommodate any anomaly on any stage at any time whilst also confining the audio from each space to within its allotted territory. Secondly, they wanted to put some atmosphere into a business festival without it being intrusive. IBF2018 focused on different business genres each week, showcasing products and unique opportunities to meet business owners, investors and entrepreneurs from over 90 countries via a series of events, workshops and panel debates with industry leaders, distributors and deal-makers. It is a lively and imaginative forum for exploring ideas, and one where innovation, curiosity and creativity can lead to smarter commercial activity. 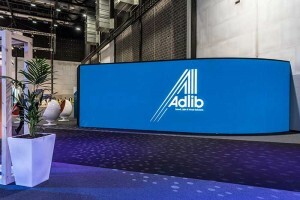 Adlib had to provide systems and technicians to cater for five diverse environments: the Futures main conference, the very popular Knowledge Hub stage, the Next Generation zone plus the lounge and entrance areas. To achieve all of this smoothly, thorough and meticulous preparation was key. Adlib’s team had to be ready for any eventuality, from bizarre and off-beat presentation requirements to specific headset mic requests. With many events taking place simultaneously in one open space, super-tight zone control was crucial to the audio design, so limiting and focusing dispersion from the different areas was a massive consideration. The Futures Stage featured a six-metre-wide by three-and-a-half-metre-tall Absen A3 video wall, complete with playback via one of Adlib’s custom QLab / PlaybackPro systems, supported by Panasonic remote controlled cameras. 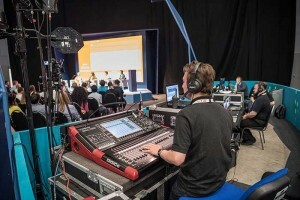 Crisp, clean high clarity audio was delivered by a flown Coda ViRAY system with Coda TiRAY delays and a DiGiCo SD9 mixing console at the heart of the system. Twelve generic profile luminaires were used to light the stage and for key lighting for speakers, presenters and guests, while eight new Claypaky Axcor Profile 900 LED moving lights provided atmospherics and many additional subtle visual effects like variations in colouring and texturing. The Knowledge Hub featured a Panasonic PT-RZ970 projector fitted with an ultra-short throw lens, rear-projecting onto a Stumpfl screen. For the lighting aspect, ARRI 300 Plus and 650 Plus Fresnels on Avenger flag stands brought a flourish of TV studio style, and the PA was a precisely positioned and angled K-array Python passive speaker system, picked for its elegant appearance and sonic clarity. The Next Generation was a vibrant and animated youth educational area, kitted out with 55” TVs and an Adlib AA81 audio system geared for presenters / speakers and music. The Connections Lounge and entrance corridor also hosted smaller presentation areas that required background music systems together with some straightforward but versatile moving light treatment which could be varied if needed. 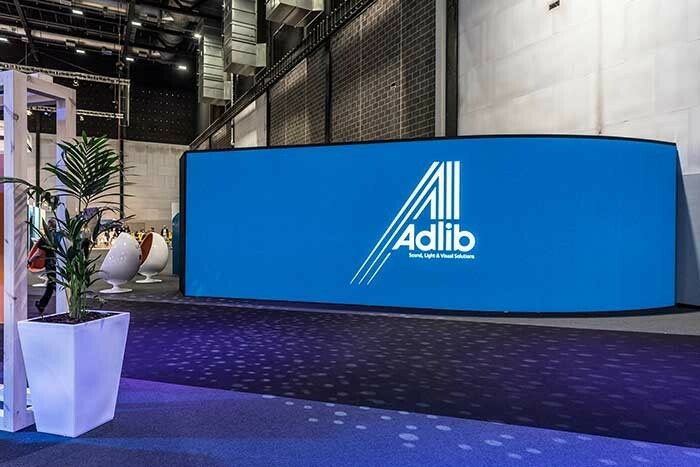 The first item of technology greeting delegates and the public after registration was a ten-metre-wide by three-metre-high curved video wall welcoming everyone to the Festival, which was made up from Adlib’s new Unilumin UpadIIIH5 LED, which looked stunning. 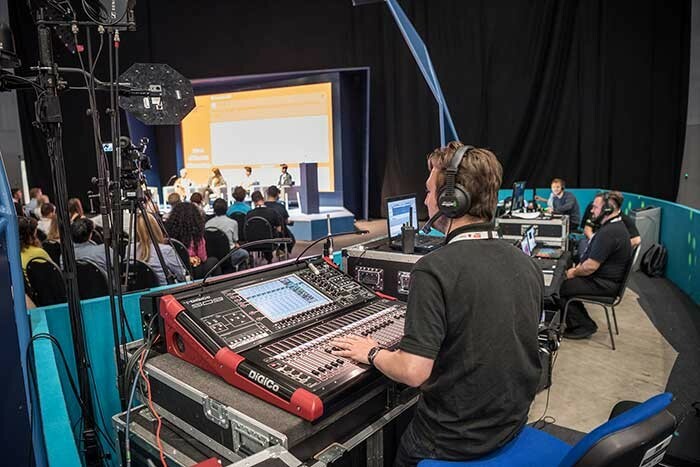 Adlib also provided rigging, motors and trussing, plus lighting, PA and technicians to live event and experiential specialists Innovision, for its ‘Britain is Great’ stand in the expo section of the venue. Adlib MD Andy Dockerty commented:, “We were very honoured to win this a high-profile contract again. It enabled us to showcase a full portfolio of products, skills and services, from LED walls and projection to PA and lighting, together with set and rigging including motors and trussing. Also, our extremely talented crew of designers, engineers and technicians who set up and ran everything.